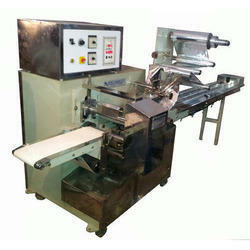 We are a leading Manufacturer of horizontal flow wrapper machine from Noida, India. For our reputed clients, we are highly efficient in manufacturing a distinguished spectrum of Horizontal Flow Wrapper Machine. The provided machine is manufactured under the rigid supervision of our adept professionals employing contemporary techniques in complete compliance with the set international standards. Product application Laundry Soap, Bathing soap, Detergent cake, chocolates, chocobar, Papad, noodles, electrical items etc. Manual feeding through in-feed conveyor with Pushers. (Approx. 2 meter long). Pillow type / Center sealing. Gear Motor 1 HP, 3 Phase (Standard Make). 440V, AC, Three Phase, 50 Hz.